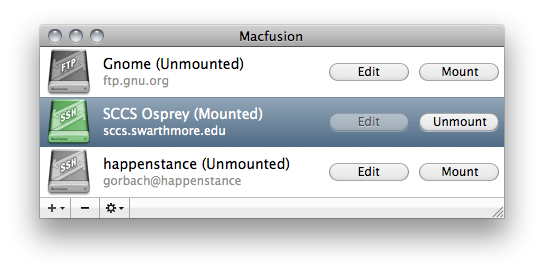 Macfusion brings servers from across the internet directly to your Mac's desktop! Mount files and documents as a "Volume" in the Mac OS X Finder. Work with your files using your favorite Mac OS X applications directly. No manual upload or download needed! Support for SSH (Secure Shell) and FTP (File Transfer Protocol) servers. Uses your machine's native configuration for SSH, including support for private keys and custom settings. 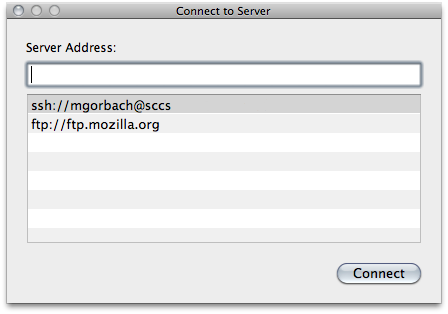 Quickly connect to a any server using the Quick Connect dialog, accessible from Macfusion's optional menu item. You need to have the latest for version of Google's MacFUSE installed in order to use Macfusion. Get it here. You can download thhe source code for this project project in either zip or tar formats.